In the last decade DJI has revolutionized the aerial photography and video industry. When they introduced the Phantom they introduced aerial video and photography to an entirely new atrarket. Working with the Phantom 2 with a Zenmuse X3 gimbal since 2014 we rarely used it as the images and operability of the drone just didn’t live up too the level of production we hoped. In 2016 though at Jamestown Films we took the step though to purchase the Inspire 1 X5R. Based on some previous experience with it we were confident we could reach the quality we needed for our productions. When Inspire 1 was introduced in November of 2014 with the X3 camera we were immediately excited with the capabilities the drone could offer its pilots. When they upgraded the camera in early 2016 to the X5 and X5R it made us wonder just how competitive the Inspire 1 X5R would be with larger drones that could fly with a full camera system. We have seen a long time drone operator switch from full camera system commercial drones to the Inspire 1 X5R. He told us that it is the best decision he ever made. Lets take a look at the DJI Inspire 1 X5R. If a pilot comes from a commercial drone like the Matrice, they will first notice the compact case that the Inspire 1 comes in. If the pilot comes from a Phantom, they will notice this huge brief case that they will now have to lug around. The Phantom is more portable, but lacks the image and operability that the Inspire 1 gives you. The Inspire 1 drone is more competitive with the Matrice and should be compared to the Matrice system. The Inspire 1 X5R requires far less equipment to operate. We loved that we didn’t have to drag cases for the gimbal, drone, camera and lenses around to obtain a high level arial image. The Inspire 1 X5R includes one battery, two remotes, an Inspire 1, and the X5R camera which comes in a separate hard case within the Inspire case. To truly operate and shoot for a day you will need more than one battery. Each battery has about a 35min of flight time. I like to have at least 3 batteries for straight forward shoots where I wont need to have multiple takes. But, If the shots are more complicated and needing multiple takes I would prefer to have 5 batteries or more. The main controller operates the drone with DJI GO app available on iOS or Android. DJI has made an excellent app that turns your phone or iPad into a first-person view, also known as an FPV, monitor. Your iPad or iPhone isn’t just a monitor, you can set focus, exposure, check histogram and get all of the information that you could ever want right at your finger tips. This app makes it a pleasure to be both the pilot and camera operator. When operating in dual remote, where one person is the pilot and the other is camera operator, the camera operators remote piggybacks off of the pilots remote receiving a video signal from their controller. Both the pilot and camera operator share a camera view. This can become a problem in two ways. 1.) if the operator is far away from the pilot the FPV starts crashing and makes controlling the drone difficult. 2.) As the camera operator moves the camera around, as a pilot, you loose all sense of direction often times making getting the shot near impossible. The Inspire 1 drone generally operates though with intuitive ease, making it a pleasure to fly and operate as a pilot in single operator mode. The dual operator mode needs some major improvement, which have been answered by the recently announced Inspire 2. For example, they add a flight camera that is just for the pilots FPV, while having the ability to view the shot in a smaller window. And more object avoidance sensors. The X5R is capable of capturing incredible images for such a small camera. The specs for this little camera are impressive with 12 stops of dynamic range and a 4K raw .DNG recording option. The quality is absolutely amazing. While recording raw it also records a .mp4 reference file for reviewing the shot or quick access. Color correcting and grading the raw images produced by this sensor is, well, Inspire-ing. The ability of the image to bend and not break makes it able to match many high end cameras. We’ve seen this footage cut in with RED Scarlet-W and an Alexa Mini footage with ease. One drawback to be aware of is that this is not a low light camera. Its sensor is micro 4/3s and noise can become significant if you go too far up with the ISO or need to lift the the exposure too much on an underexposed image. Great thing though is that with the raw data in the .DNG files, the shadows, though grainy, can be recovered. We’ve had good results with the Neat Video plugin de-noising the image for an excellent low light end result, but it adds more steps and time to post production. As great as the benefits of raw are, there is one big drawback. That is the post production workflow. For one thing, raw files take up a lot more drive space. So plan accordingly. After a shoot you remove the proprietary DJI SSD from the X5R base and insert it into a DJI dock. You have to then open DJI Cinelight (for Mac) or DJI Camera Exporter (for Windows) and from there either transcode to whatever flavor of ProRes you would like, or export the raw footage to folders of raw .DNG files. This process can take a long, long time. Hours. The files unfortunately can not be accessed through the file browser before processing through Cinelight. So, there is no drag and drop option with the Inspire 1. This has been addressed with the Inspire 2 and we’re hoping that functionality comes to the Inspire 1 as well via firmware update. This is the biggest draw back to the X5R. It adds so much time to the offloading workflow that shooting all day in raw requires multiple, expensive, DJI SSD’s. We prefer to get ProRes 4444 XQ out of DJI Cinelight for three reasons. One, ProRes is a great editing codec. It has great playback performance and renders quickly. Two, 4444 XQ maintains near raw quality. Many features films are shot directly to 4444 XQ. Three, FCP X, unfortunately, does not have true image sequence, imported as a clip, support. There’s a simple enough compound clip workaround, but if you have many shots that gets annoying. If you are someone on Windows prepping footage for someone on FCP X then output to .DNG sequences. Then the editor can run those through Compressor or DaVinci Resolve to create ProRes 4444 XQ clips. Luckily the Inspire 2 RAW has addressed and simplified the whole workflow and can now record directly to ProRes! The Inspire 1 X5R is an excellent drone system that spanned the market gaps between low and high budget video. The Inspire 1 X5R is an excellent drone system that spanned the market gaps between low and high budget video. It over lapped into the high end commercial drone world. The affordability and portability of the Inspire 1 make it, for most people, a first choice when considering which drone to purchase. This drone’s ability to fly at high speeds and with precision makes it a great pleasure to operate, but the lack of a pilot FPV makes dual operation difficult. We absolutely love operating this drone and believe that it is a unique and boundary breaking tool for the media world. This guest blog post is from Braden Storrs and Patrick Newman. I’m a Utah based editor and video creative. As post production manager at Jamestown films I’ve had the chance to work with some great people on great projects and continually improve our techniques and workflows in an ever changing digital landscape. I am also the creator of the Final Cut Put X Editors Facebook group and can can be found at @thefcpeditor on Twitter. I love trying to elevate each project a little more then the last. In the end, I’m a storyteller. Apple finally brought in a key missing piece to its 4K editing workflow/ Thunderbolt 2 Mac pipeline. On the high end, you’ve got the Mac Pro with dual GPUs, Thunderbolt 2 buses and the ability to run up to 3 4K displays. On the Mobile end, you’ve got the Macbook pro which has a 4K HDMI out. 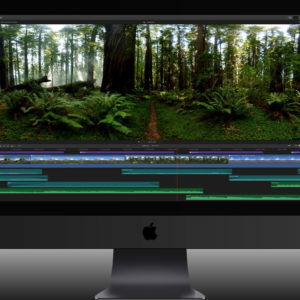 You’re going to be able to easily monitor pixel-for-pixel 4K footage on a solid display and in many ways, the new iMac represents the missing piece for 4K workflow: a very high quality, affordable 4K workstation to watch/edit all the 4K material that the new cameras from BMD, AJA, Sony, RED, GoPro, Panasonic, and pretty much everyone else are now recording to by default. The main challenge up to this point was that even though you were recording to these formats, it was hard to actually monitor the resolution. Now, your average editor is going to be able to do that, and I think that this iMac release is further confirmation that it’s time to get your 4K workflow together. The price point for the 5k Retina iMac is also really astounding at $2499. 4K editing is here. Let’s all get back to making movies now. My real takeaway from the 5k iMac is that we’ve finally got a machine with a proper standard 4K ready panel that makes it easy to view and edit in a great form factor. As usual, Apple took something that everything else was making really difficult (4K display/editing) and put it all together into a computer that makes the workflow a lot more straightforward and makes you wonder why no one else is offering something like that already. (No doubt Apple’s scale of manufacturing and ability to source exclusive vendor arrangements helps a lot here). 4K is here. Time to upgrade if you haven’t already… and if you need an iMac-based Final Cut Pro X package, FCPWORKS is a full Apple reseller with unique workflows and tons of experience with FCPX. We’re ready to get you up and running now. (One hint, you’ll probably want to get the AMD Radeon R9 M295X 4GB GPU option and not the stock configuration). TED made the official transition to FCPX on September 1. “There really was a long runway before officially switching,” says Glass, “but we made that the date at which we would never open FCP7 again in order to edit a talk from scratch,” he says. “If we need to go back into a previous edit, instead of trying to translate from one to the other, we’ll edit in the old software.” Assisted by Sam Mestman from FCPWORKS, the TED editorial team spent six months training in the new version, starting with tutorial on Lynda.com and Ripple Training and moving to one-on-one tutoring with Mestman, especially at the beginning and again during the week “marathon” leading up to the official transition. “This whole process really started almost two years ago,” says Glass. “We knew Final Cut Pro X was there, but we also looked at Premiere, Avid, even Smoke at one point. We narrowed it down to Premiere and FCPX, and once we had the lay of the land from the press and what we could read about it, we took two-to-three-day intro courses offsite to both softwares. That gave us a good handle on where the problems would be, whatever we took on, and also what the advantages would be. People were starting to come around to the idea of FCPX before Sam showed up for a week here, rotating through two-hour sessions one-on-one with each of the editors and assistant editors. I think having someone be able to walk you through the nuts and bolts of how it all worked, as well as give the context of how to think about this new-ish approach to editing made the editors finally feel safe and excited about taking on the new technology. "I think having someone be able to walk you through the nuts and bolts of how it all worked, as well as give the context of how to think about this new-ish approach to editing made the editors finally feel safe and excited about taking on the new technology." But to make that leap you still need someone to encourage you along the way that you’ll land safely. That’s when everyone came around. They went from saying, half-heartedly, ‘OK, I can use this,’ to ‘Wow, this will actually improve my workflow, and even makes editing kind of fun again.’ That was better than even I expected. When you’ve got a $500 camera doing 4K at 30p the argument against a delivery falls apart. Whether or not your your camera does that may be open for debate, but the idea that 4K and beyond is where everything is going isn’t. It’s become so possible now to shoot and edit in 4K there’s no reason to not have clients ask you to finish at that resolution as well. The good news is that at least in the short term it will be a nice premium deliverable you could charge for (or be paid extra for by distributors) as there is currently a shortage of quality 4K content being delivered… and there’s all these TV’s being manufactured that need content. I believe that the HD vs. 4K argument will look back at this GoPro announcement as pretty much the final nail in the coffin. 4K is not going anywhere… not at that price point. 4K will not be the next 3D. It’s now to HD as HD once was to SD. The format you have in your camera and the workflow you want to learn for post. We’ve been in these waters for a while now and are happy to help, drop us a line. Had a chance to check out the Canon DP-V3010 4K Reference Display last night. It was, hands down, the nicest small screen monitor I’ve ever seen. If you’re one of the people who say “4K resolution doesn’t matter, blah, blah, blah…” I offer this monitor as proof that it does matter, regardless of display size, and it is very relevant if the panel on the display is nice enough. Anyway, It’s a 30 inch monitor and does 4K DCI (4096×2160) as well as Quad HD Resolutions (as well as a high quality upscale for 2K and 1080). Color is beautiful… and is DCI-P3 accurate as well as Rec-709 accurate. Anyway, there’s only one tiny problem with it… it’s $30,000. A slightly smaller problem is that it doesn’t take HDMI… you’re going to need to run a Quad SDI signal to it to run the 4K into it… meaning you’re going to need either the AJA IO 4K or BMD Ultrastudio 4K to really work with it. So… basically… it’s expensive and still a bit complicated… but it also looks awesome. As soon as the price point for a monitor like this becomes manageable (let’s say 5 grand), and HDMI becomes a legit option, 4K will officially become the standard we’re all working in. Regular HD monitors started this way too… the good ones were really overpriced and complicated at first… so this is nothing new. It’s just a matter of time. It’s worth checking out if you ever get the chance to see one in the wild. Looks like Arri is doing 6k and the RED Dragon officially has its first bit of 6k competition. And if you’re wondering why you should be shooting 6k… well, in my opinion, you certainly don’t need to deliver in 6k, but for the same reasons that it gave you a lot of flexibility to punch in from 4k down to 1080… well, it’s basically the same deal going from 6k down to 4k. It’s all about flexibility. As far as I’m concerned, the Dragon is still my first choice on the high end if I had to shoot a feature… but, well, when we know a little more about this camera (price/ship date), that may change a bit. It seems like every day some crazy new camera comes out that changes the whole game. Whether it’s the Panasonic GH4, Sony A7s, RED Dragon, the AJA Scion, all the BMD Cameras (I can’t keep track of what’s current), or the Alexa 65… I guess all it really means is that we as filmmakers have a lot of great new options… and as editors, a lot of different formats and styles we’ve got to keep track of. No more RED proxies necessary? If you have transcoded RED RAW files to ProRes through a third-party application, you can relink to the original RED files within Final Cut Pro. For me the Proxy workflow with RED stuff always worked fine… but last week, I did a little test. Basically, I brought some RED files into FCPX, did a quick batch rename, some prep, etc. Then, I went and transcoded out a 1:1 5k prores LT file from the Epic footage in REDcine-X. I went back into FCPX to relink from the R3D to the RCX prores file… relinked with no problem. It would seem that you don’t need proxies anymore to be offline/online with RED footage… you can import your RED files right into FCPX, get prepped, etc… in the meantime, you can be trancoding that same footage through RCX to whatever codec you want (I’d typically recommend Prores LT for offline)… and then when you’re done transcoding, just relink to your to your transcodes, edit away, and when you’re done, relink back to your RED files and then finish. There should be no downtime and your relink should be almost as fast as flipping from proxy, except that you won’t be stuck with the prores proxy codec for your offline, and you can work with other non-RED formats in the same timeline in optimized/original mode largely without issue. Kind of awesome. One small caveat – when you’re transcoding your RED footage, make sure your timecode setting matches the timecode displayed in FCPX. I did a test that had the timecode set to Edgecode for some reason, and it caused some relink issues until I noticed that my timecodes for the Prores transcodes weren’t matching the timecodes for the RED files in FCPX. Once I was on the right timecode setting, I was able to relink without issue. Anyway, for smaller RED only projects, I’m still going to use the Proxy workflow, only because it’s so easy and I can transcode in the background right in FCPX, and flip modes as necessary… however, for longer form work where I know I’ll be working offline for an extended period of time, the flexibility of being able to easily relink to RCX transcodes is great. While I’d love it if it supported full 4K DCI (4096×2160), this is still a big step in the right direction for them. What’s really nice about this is that’s it’s going to shoot out Prores, and not some ridiculous, impractical RAW format that’s going to be hard to work with… although it seems from the diagram like they’re not quite supporting Prores XQ, which is a bit of a drag. That’s the capture format I’d love to see for feature/high end work. Regardless, a huge step in the right direction. Whether you all like the way the ARRI Amira is set up or not… you need to start thinking about how you’re going to shoot and master in 4K. It’s going to become the new standard. PS- and don’t forget to tune into FCPWORKS’ Sam Mestman appearing on the Final Cut Virtual User’s Group at http://hazu.herokuapp.com/pixelcorps/fcvug-3 at 1:00 PM PST today! Sam here… finishing up 4K week on FCPWORKS Workflow Central with one more post. So… BMD or AJA… the eternal debate. Right now, we’re centering this around the 4K monitoring & I/O products, AJA’s IO 4K or the BMD Ultrastudio 4K. 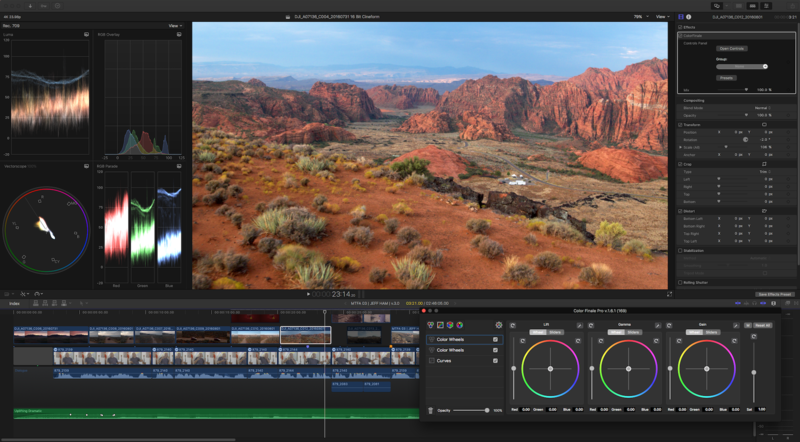 Basically, it comes down to this… Do you use DaVinci Resolve for Color Correction? If the answer is yes, you’re going to need to go with Blackmagic. Case closed. Blackmagic Devices are the only ones that will work with Resolve. However, If the answer to that question is no, and you’re doing your color work primarily in FCPX or another program that isn’t Resolve (Scratch, Baselight, Smoke to name a few) the discussion becomes a lot more complicated. Additionally, in the case of the BMD Ultrastudio 4K… it’s can be loud. The AJA IO 4K is quiet and considerably smaller. If you’re keeping the product in a room with a new Mac Pro as your primary computer, you really start to hear the Ultrastudio 4K when it’s on…. and if you’re doing serious sound mixing, the noise makes a big difference. Additionally, and this is a little known fact, but the AJA cards support more monitoring formats for FCPX as well. For whatever reason, your monitoring formats in the Blackmagic preferences (system settings on the Mac) are more limited and considerably smaller than when you’re using your Ultrastudio 4K in Resolve. HOWEVER, at the end of the day, price is also a factor and the AJA products are almost universally more expensive than their BMD counterparts. So price vs. performance is definitely a consideration. In my opinion, if you’re more interested in specific features, go AJA. If you’re budget conscious or a heavy Resolve user, go BMD. p.s – little known fact, but the HDMI out on the back for the New Mac Pro can be used as an 8-bit A/V out in FCPX, and it is FAR more configurable for video I/O if you’re using weird sequence settings and just need to send out a 1:1 output over HDMI than what’s available through your BMD or AJA device.